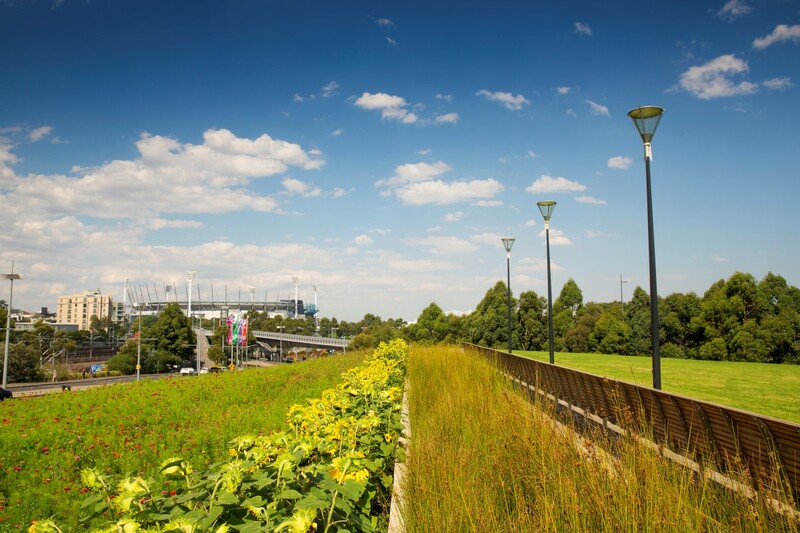 A stormwater harvesting system has been built in one of Melbourne's most visited parks, allowing us to keep the space green and healthy without relying on drinking water. 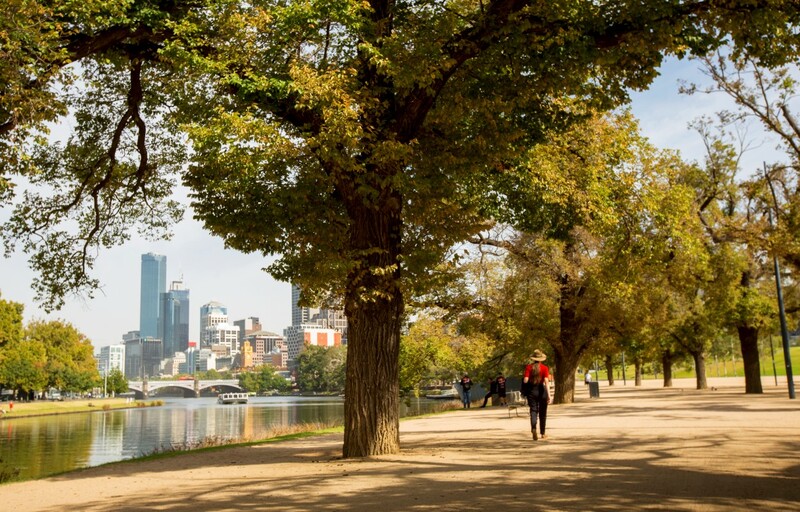 Birrarung Marr is an 8.3 hectare park located on the northern bank of the Yarra River, next to Federation Square. 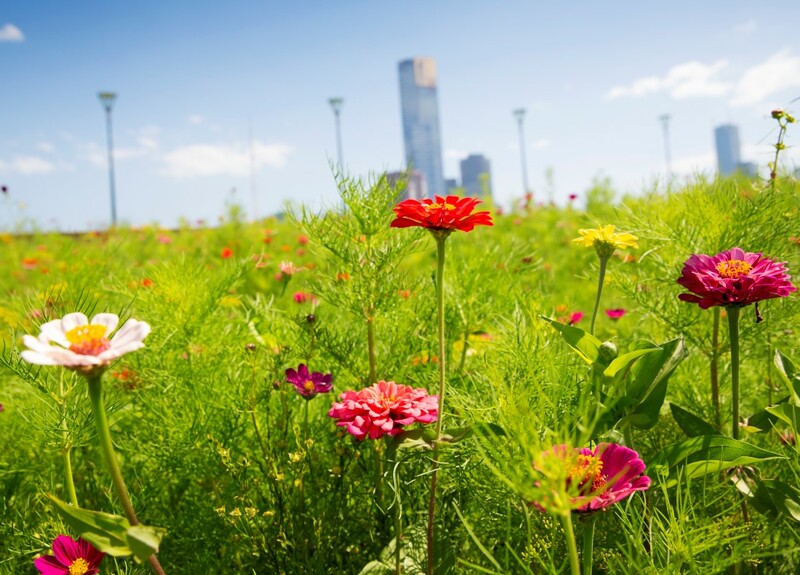 Transformed from a rail yard into parkland in 2002, Birrarung Marr is the newest large park in the inner Melbourne area. The popular and versatile space is home to many events throughout the year, from Circus Oz, to Moomba, to sporting events and festivals. The park is also a major thoroughfare for millions of pedestrians. 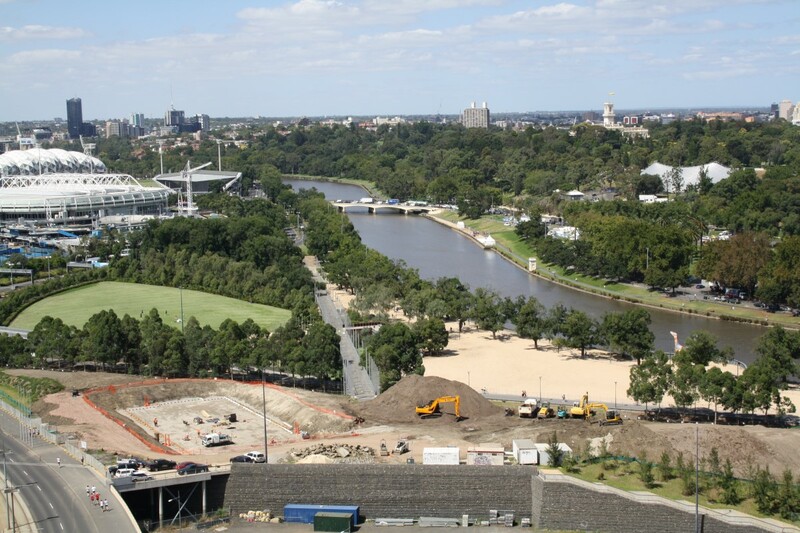 It links the city centre to the MCG and the Melbourne Park sporting precinct. Birrarung Marr has three separate terraces stepping up from the river, connected by a central pedestrian bridge. 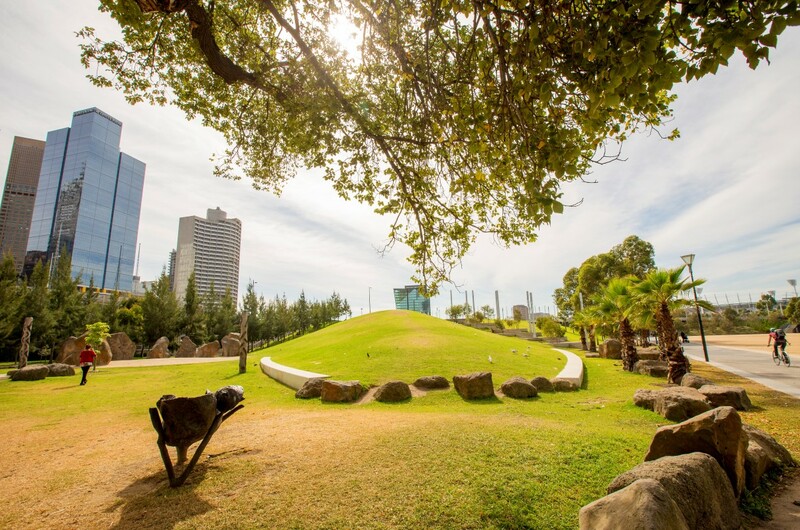 The park’s six hectares of vegetated space require approximately 45 million litres of irrigation water each year. 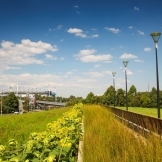 The Birrarung Marr stormwater harvesting system captures, treats and stores stormwater for irrigation reuse in the park. This has reduced use of potable water for irrigation by 70 per cent. 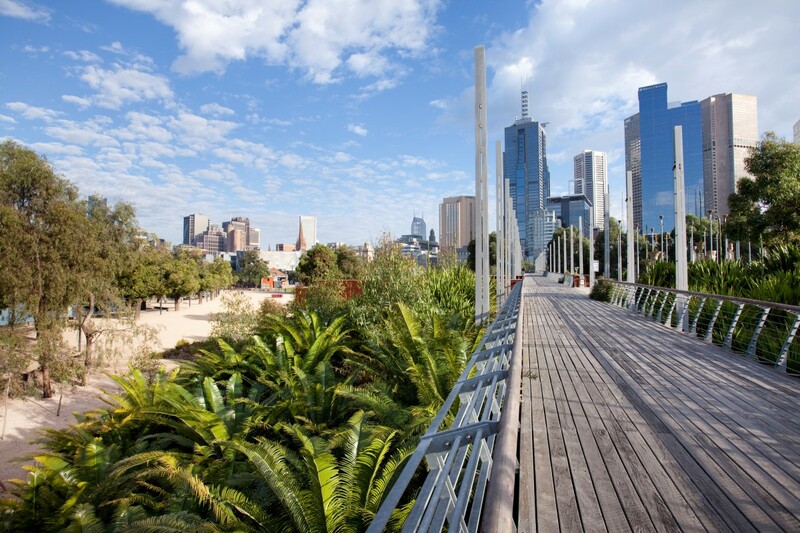 Birrarung Marr contains many native and exotic plants, contributing a wealth of environmental, social and economic benefits. The stormwater harvesting system provides a reliable irrigation source for these plants into the future. 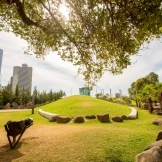 The park is located between the Yarra River and several busy roads and multi-storey buildings. It plays a crucial role in intercepting polluted stormwater runoff before it enters the river. 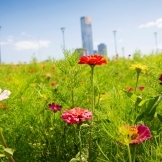 The system is part of the Eastern Melbourne Parks and Gardens Stormwater Harvesting Scheme. Overall, the Scheme received $4.8 million in funding from the Australian Government’s Water for the Future initiative. 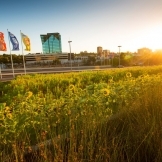 What benefits has the stormwater harvesting system provided? Facilitated landscaping upgrades, including the flowering meadow at the storage tank site. 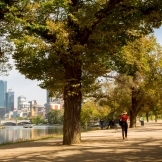 As a result of drought and heat stress, several trees in Birrarung Marr are expected to die in the next five to 10 years. The stormwater harvesting system has helped to prolong the life of these trees. It will also support the replacement trees that will be planted. 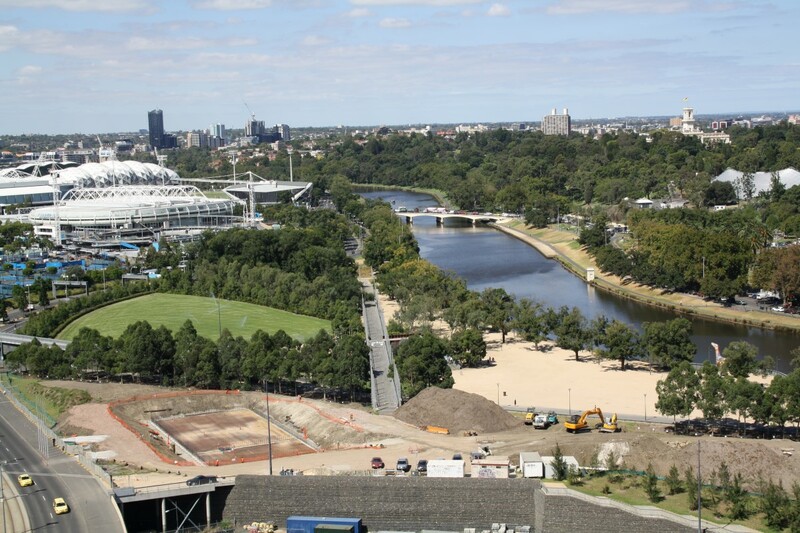 Taking its name from the Woiwurrung term meaning ‘river of mists’ or ‘beside the river’, water is a key element in the design of Birrarung Marr. The park’s landscape represents the original billabongs and lagoons in the area. 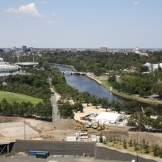 Birrarung Marr is the drainage point for a 37-hectare catchment area. This area includes the residential zone south of Wellington Parade and the gardens around the MCG. The catchment’s existing stormwater drainage network flows out to the Yarra River. The harvesting system diverts stormwater from the exit point to be treated and stored for reuse. The Yarra River is tidal and higher in salinity in this location. We installed specially designed valves to prevent saline water entering the treatment system. External funding was helpful to fast track the implementation of this project. 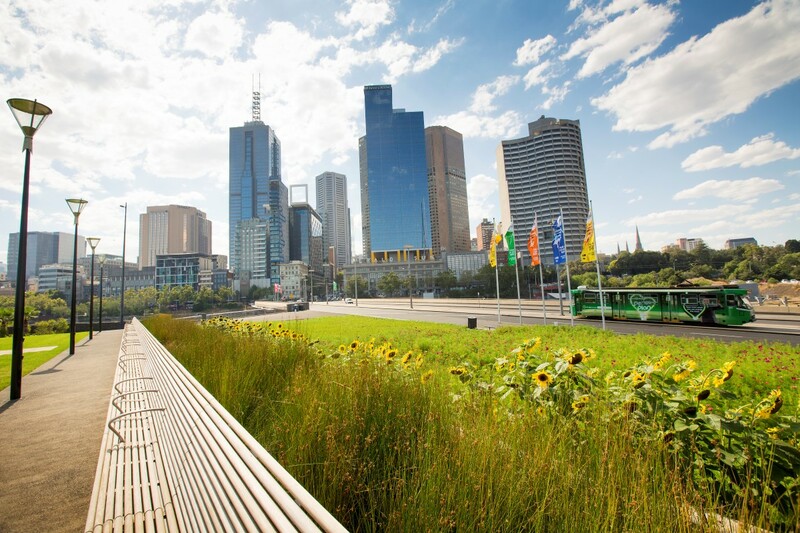 It, along with the multidisciplinary team required to deliver these projects, has enhanced knowledge and support for whole of water cycle management within the City of Melbourne. Feedback from the community has been overwhelmingly positive, particularly in response to the innovative flowering meadow landscape feature. While this element is only aesthetic, it has added to the community benefit of the project. Birrarung Marr enhances the character and liveability of Melbourne, contributing social, environmental and economic value to the city. 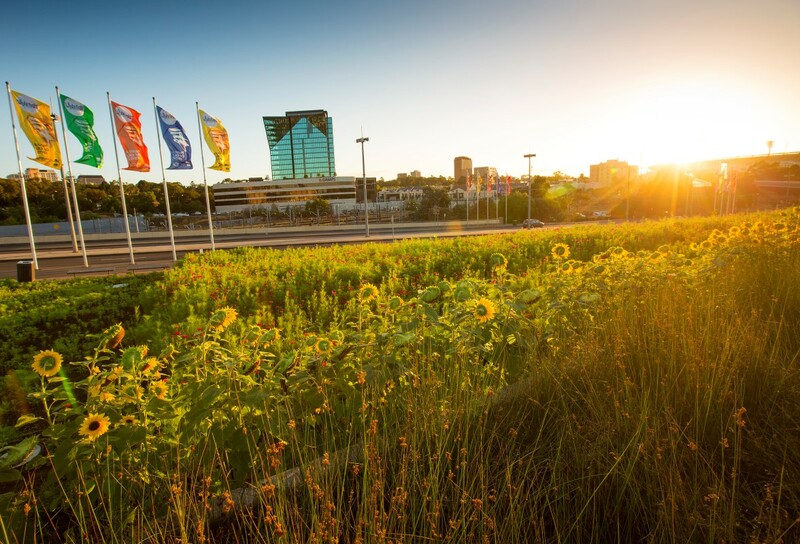 The stormwater harvesting system provides a reliable irrigation source that will sustain the park regardless of climate change, drought or water restrictions. The system delivers benefits to all Melburnians by improving the quality of water that enters the Yarra River and Port Phillip Bay. In addition to reducing pollutants in stormwater runoff, the harvesting system also regulates the flow of stormwater. This prevents flushing of the aquatic habitat in the Yarra following heavy rain. 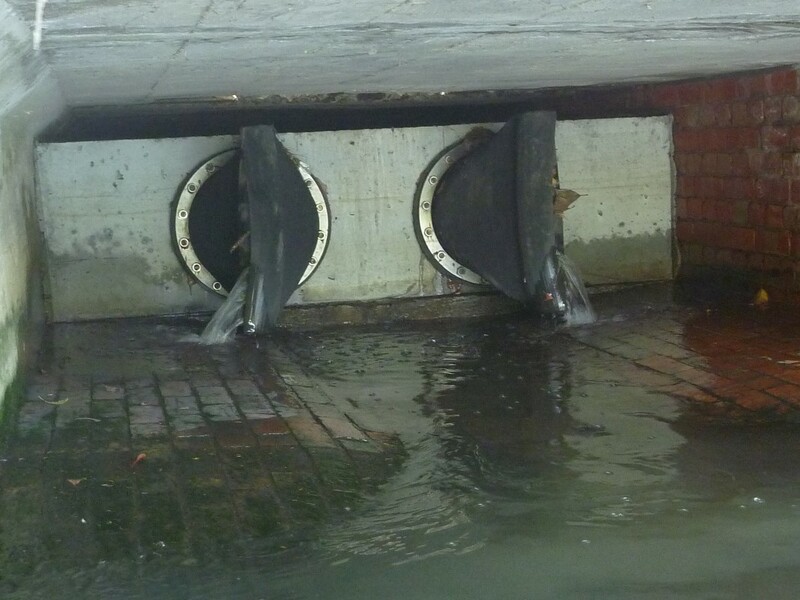 MUSIC modelling was used to determine which system design would most effectively remove pollutants from the stormwater. We carried out a geotechnical survey that found no contaminated soil. It confirmed that the Coode Island silt soil on the Upper Terrace could adequately support the weight of the tanks. We drew up a water plan of the park showing the location and size of different types of vegetated areas. This was used to calculate the park’s irrigation requirements. You can download this landscape plan at the top of this page. During excavation a bank of council owned cables was found at the tank site. This delayed construction and added cost to the project. 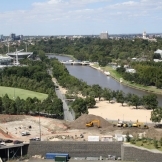 Using out of date maps caused this oversight..
Birrarung Marr is a premier event space for Melbourne, so it was essential to inform the community during the project’s development. We did this by installing signage at the site. We gave presentations at a range of industry conferences and events. We also took industry groups and local and international organisations on project tours. 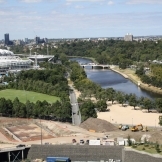 Birrarung Marr is an important event space for the city. This placed constraints on our design and construction methods. Ideally, we would have located the dual tank system on the Middle Terrace. This would have been closer to the diversion point, reducing the cost of constructing and operating the pump system. As the Middle Terrace is regularly used for events, we built the system on the Upper Terrace instead. This meant that construction and maintenance could be carried out much more easily. 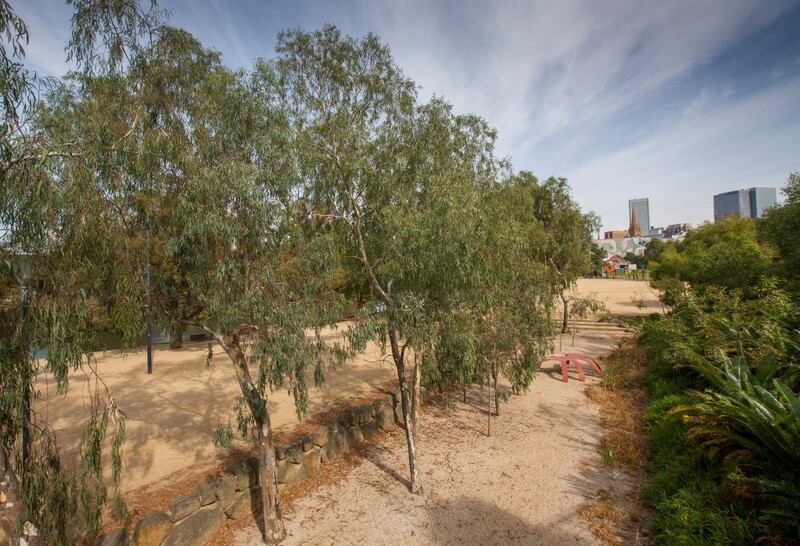 The section of the Yarra River that flows past Birrarung Marr changes level with the tide and contains a mix of fresh and salty water. Saline water is not suitable for irrigation, so we used one-way flow valves. The valves ensure that water from the Yarra does not flow back into the system. The storage tanks were also located separately to ensure that saline water does not enter the system. Public open space is at a premium in the city, so it was important that the proposed solutions had the smallest ‘footprint’ possible. We placed our dual storage tanks underground, and made sure the design was well integrated into the landscape. The close proximity of important infrastructure, such as train lines and roads, presented some challenges. We had to maintain the stability of the soil around the tank to prevent any damage to Batman Avenue or the Flinders Street rail yard. We carried out research to locate the exact position of existing soil anchors, so our design and construction didn’t interfere with them. Tanks are one of the most expensive components in a stormwater harvesting system. During the design phase, the size of the tank needs to be weighed against the irrigation demand to determine the most cost-effective approach. In general, we aim to meet between 70% and 80% of the annual irrigation needs with any system. 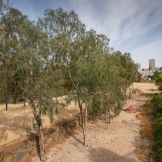 Lower Terrace, at the point where water is diverted from the stormwater drain and into the system, adjacent to the Yarra River. The weir was constructed within the existing twin culvert at this location. The weir excludes saline water from the Yarra and retains stormwater within the culvert to be pumped to storage. When the primary storage tank is full or flow exceeds the capacity of the pumps, stormwater flows into the river through specially designed valves. Purpose: When the storage tanks and diversion weir are full, Rubber Tideflex valves allow the water to flow out to the river while also preventing any saline water from washing back into the weir. The valves are made using rubber that defaults to a certain shape. They open when there is sufficient water pressure behind them and close when the pressure drops. Location: Between the diversion weir and the Yarra River. In fact, the valves can be seen from across the river. Special valves allow excess stormwater to flow into the Yarra and prevent salt water from flowing back into the system. 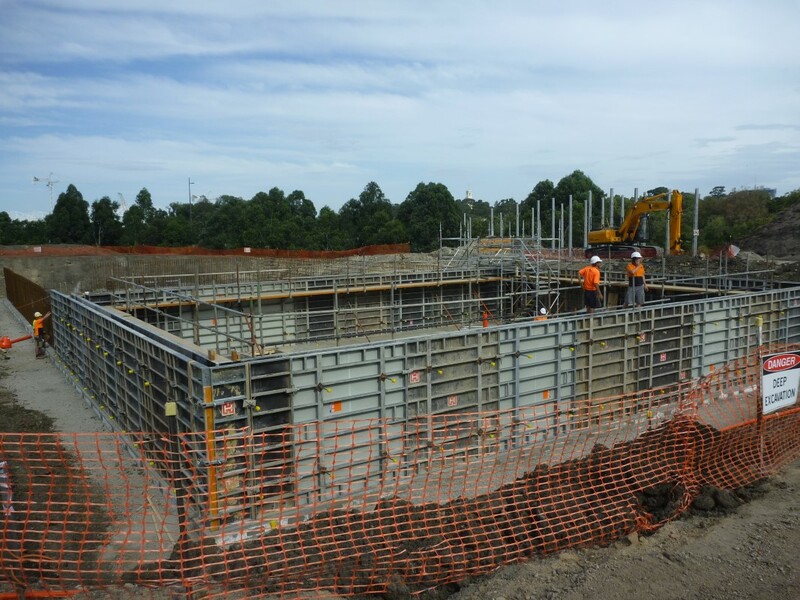 The pumps transfer stormwater from the diversion weir to the primary storage tank on the Upper Terrace. The diversion pumps activate when the primary tank is below capacity. They switch off automatically when the tank is full. Concrete dual tank system, poured on site. We used reinforced concrete for its structural stability during heavy flooding. The soil beneath the tank is Coode Island silt, which has a tendency to settle over time. The concrete tank is able to withstand slight shifting without membrane breakages. 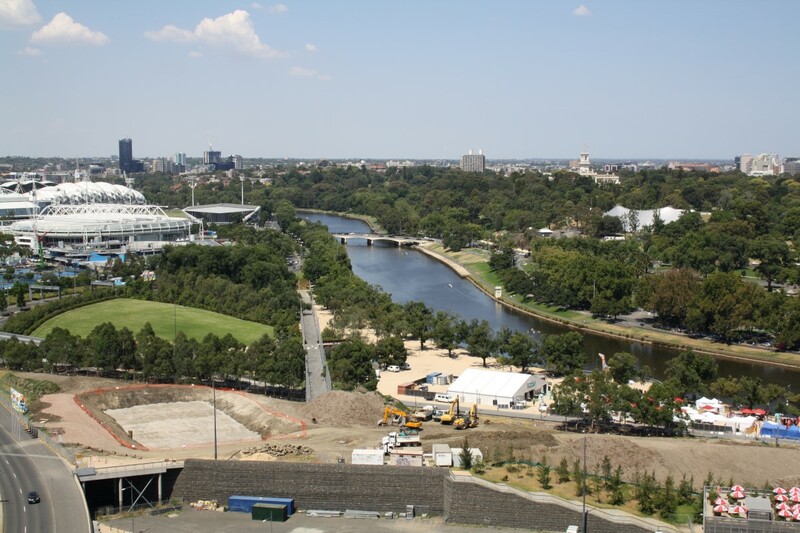 The tanks sit side-by-side on the upper terrace of Birrarung Marr. It is not ideal to have the tanks so far from the diversion point (on the lower terrace), but the constraints of the site limited the possible locations. The top of the tanks are about 4 metres below the surface. The primary tank stores untreated stormwater for cleaning. The secondary tank stores water that has been cleaned by the biofiltration garden bed and is ready to be used for irrigation. The dual tank system is made from concrete poured on site. We used a dual tank system because the biofiltration process that cleans the water is slower than the flow of stormwater in a heavy rain event. Large volumes of stormwater can flow freely into the first tank without being limited by the rate at which the biofilter can clean it. The water in the primary tank can be gradually treated in the hours and days after the rain event, as required for irrigation. The primary tank is larger than the secondary tank because it is designed to take advantage of heavy rain events and save as much water as possible for later use. 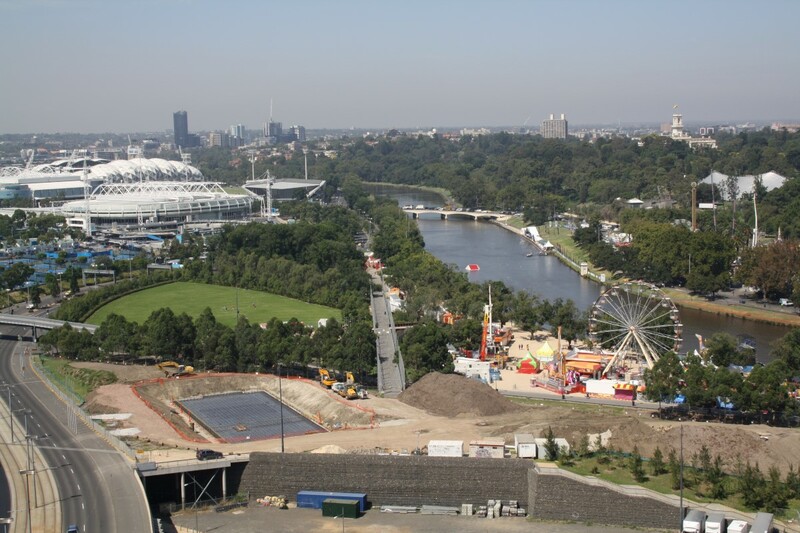 The secondary tank is sized to suit the irrigation needs of the Birrarung Marr. It does not need to be as large because it is refilled using water from the larger primary storage tank. Location: The sedimentation chamber sits directly next to the primary storage tank on the Upper Terrace. Water flows through the chamber before entering the primary tank. Purpose: It allows suspended particles of pollution – fine sands, sediments, oils and hydrocarbons – to settle to the bottom or float to the surface. Preventing these elements from entering the primary storage tank help the system to run better and reduces the need to clean out the primary tank frequently. The chamber is also easier to clean than the primary tank as it is more accessible. The biofiltration garden bed sits on the surface above the dual tank system. It is one of the only parts of the system that can be seen above-ground. The biofiltration bed is the main treatment process in the stormwater harvesting system. As the stormwater soaks through the garden bed, nutrients are removed from the water. Treated water is delivered from the secondary tank to the Birrarung Marr irrigation network by a set of three high pressure bore pumps. The mains water connections include high hazard double check valves to prevent backflow and cross contamination. The top layer of the biofiltration bed was planted with wetland plants, Juncus gregiflorus and Juncus procerus. These native Australian rushes were pre-grown and installed in large blocks. This ensured fast establishment and high quality water within the first month. The grasses are cut back once a year, when the filter medium is replenished. Monitoring detention time for filter media and replacing when needed. Maintenance costs around $27,000 per year. This includes removing litter from the GPT, replacing plants and filter media, and replacement of the pump and GPT every 10 years. The main purpose of monitoring is to ensure that the water is fit for irrigation. Following completion, the stormwater harvesting system was tested for six months. This included testing for possible problem scenarios and refining the level and pump control system settings. We included a detailed water monitoring strategy in the operations and maintenance manual. As a baseline, water quality samples are taken immediately upstream of the diversion point. Our monitoring ensures that the water complies with the Australian Guidelines for Water Recycling – Stormwater Harvesting and Reuse (July 2009), as well as Victorian plumbing standards. We monitor the water’s pH and salinity levels. Samples are also taken during irrigation season to check for E. coli, turbidity, sodium, chloride, heavy metals and herbicides. We also monitor other water quality indicators, such as nitrogen and phosphorus levels. We are committed to creating a water sensitive urban landscape, while also considering any environmental impacts resulting from this infrastructure. The pumps required to operate the system are powered using electricity, resulting in greenhouse gas emissions. The estimated power consumption for the pump system is 12,000 kWh per year. In line with the city’s Zero Net Emissions strategy, we use carbon offsets to counteract this impact.